In order to set all SRTs, the self-diagnoses as in the вЂњSRT ITEMвЂќ table must have been performed at least once. Each diagnosis may require actual driving for a long period of time under various conditions. The table below shows required self-diagnostic items to set the SRT to вЂњCMPLTвЂќ. *1: Though displayed on the CONSULT screen, вЂњHO2S HTRвЂќ is not SRT item. *2: If completion of several SRTs is required, perform driving patterns (DTC confirmation procedure), one by one based on the priority for models with CONSULT. 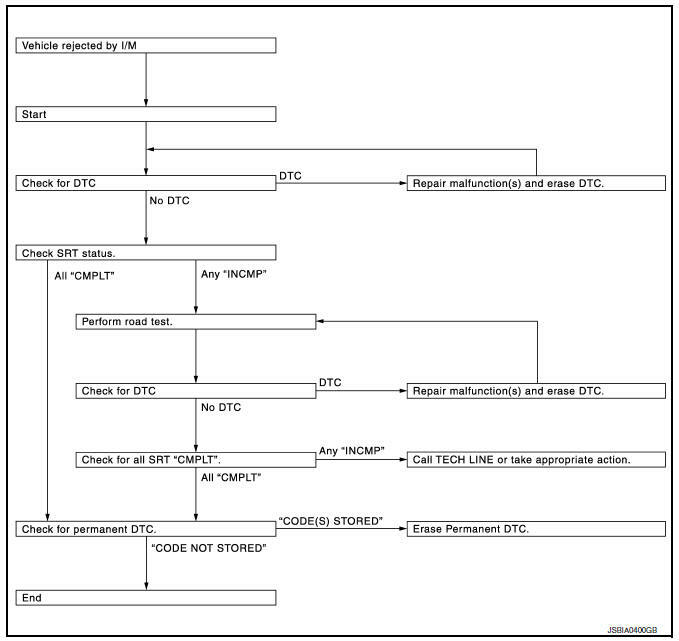 If a vehicle has failed the state emissions inspection due to one or more SRT items indicating вЂњINCMPвЂќ, review the flowchart diagnostic sequence, referring to the following flowchart. Always drive the vehicle in safe manner according to traffic conditions and obey all traffic laws. *1: Depress the accelerator pedal until vehicle speed is 90 km/h (56 MPH), then release the accelerator pedal and keep it released for more than 10 seconds. Depress the accelerator pedal until vehicle speed is 90 km/ h(56 MPH) again. *2: Checking the vehicle speed with GST is advised. The time required for each diagnosis varies with road surface conditions, weather, altitude, individual driving habits, etc. Zone A refers to the range where the time, required for the diagnosis under normal conditions*, is the shortest. Diagnosis is performed as quickly as possible under normal conditions. Under different conditions [For example: ambient air temperature other than 20 - 30В°C (68 - 86В°F)], diagnosis may also be performed. "EGR/VVT SYSTEM" written in the figure is not applicable to the vehicle. Is any DTC detected? YES >> Repair malfunction(s) and erase DTC. Refer to EC-94, "DTC Index". Select вЂњSRT STATUSвЂќ in вЂњDTC & SRT CONFIRMATIONвЂќ using CONSULT. Perform вЂњSRT statusвЂќ mode with EC-63, "On Board Diagnosis Function". Select Service $01 with GST. NO-1 >> With CONSULT: GO TO 3. NO-2 >> Without CONSULT: GO TO 4. Select вЂњSRT WORK SUPPORTвЂќ in вЂњDTC & SRT CONFIRMATIONвЂќ using CONSULT. For SRT(s) that is not set, perform the corresponding вЂњDTC CONFIRMATION PROCEDUREвЂќ according to the вЂњPerformance PriorityвЂќ in the вЂњSRT ITEMвЂќ table. Refer to EC-145, "Description". Check the вЂњPerformance PriorityвЂќ in the вЂњSRT ITEMвЂќ table. Refer to EC-145, "Description". Perform the most efficient SRT set driving pattern to set the SRT properly. 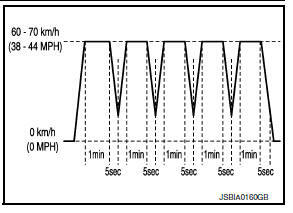 Refer to EC-146, "SRT Set Driving Pattern". In order to set all SRTs, the SRT set driving pattern must be performed at least once. Engine coolant temperature is −10 to 35В°C (14 to 95В°F). Fuel tank temperature is more than 0В°C (32В°F). Drive the vehicle. And depress the accelerator pedal until vehicle speed is 90 km/h (56 MPH), then release the accelerator pedal and keep it released for more than 10 seconds. Checking the vehicle speed with GST is advised. When steady-state driving is performed again even after it is interrupted, each diagnosis can be conducted. In this case, the time required for diagnosis may be extended. Operate vehicle following the driving pattern shown in the figure. Release the accelerator pedal during deceleration of vehicle speed from 90 km/h (56 MPH) to 0 km/h (0 MPH). Drive the vehicle in a proper gear at 60 km/h (38 MPH) and maintain the speed. Release the accelerator pedal fully at least 5 seconds. Repeat the above two steps at least 5 times. The accelerator pedal must be held very steady during steady-state driving. If the accelerator pedal is moved, the test must be conducted again. NO >> Perform this procedure again.